Click here to view our Obagi Nu-Derm gallery. The Obagi NuDerm System is the leading, clinically tested, FDA approved, prescription strength home skin care system, combining tretinoin and hydroquinone. Whereas most other products only work on the surface of the skin, the products in the Obagi NuDerm System work together to ensure deep penetration of the active ingredients. The result is smooth, clear, transformed skin that looks and acts younger and healthier. 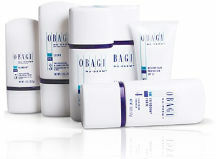 The Obagi Blue Peel is a fast way to dramatically improve the appearance and heath of your skin. It effectively removes layers of damaged and aged skin and replaces dead skin cells with healthier ones. This allows the skin's own clarity and tightness to resurface. The Obagi Blue Peel is effective for all skin colors and thicknesses for many conditions, including, laxity, wrinkles, brown spots/age spots, large pores, and acne. TheObagi Blue peel can also be used on the neck, chest, hands, arms, and even legs.